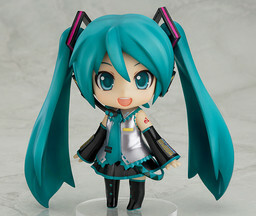 This monthes highlight character is Hatsune Miku of Vocaloid fame. 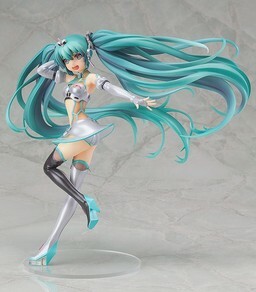 The twin tailed beauty is well-known by figure collectors all over the world. 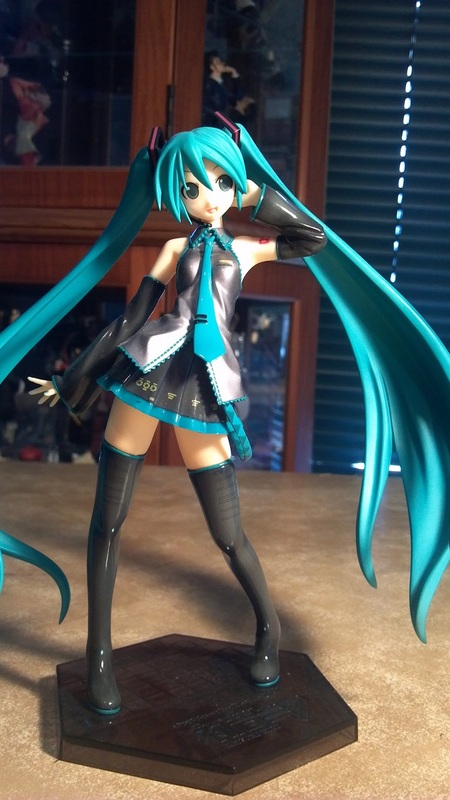 I might not have the largest collection of Miku awesomeness ever, but I am proud of my toys of this little lady. Wanna take a look? 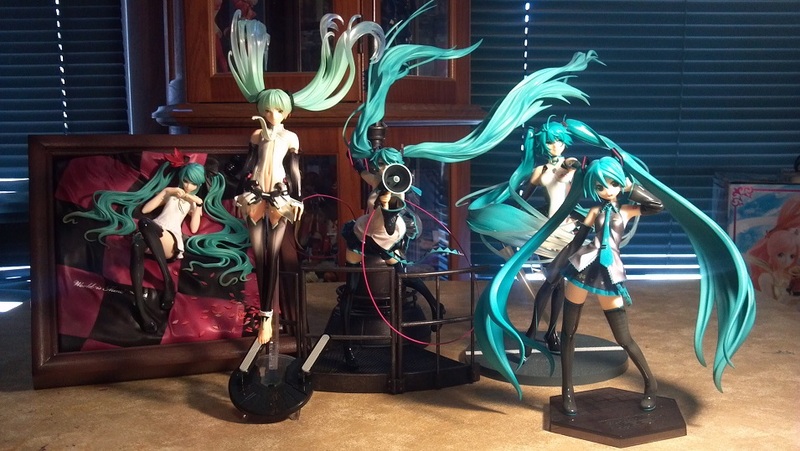 I have five statues of her, they’ve all got amazing details, and where as all of them have minor faults I do love each of these ladies in their own right. 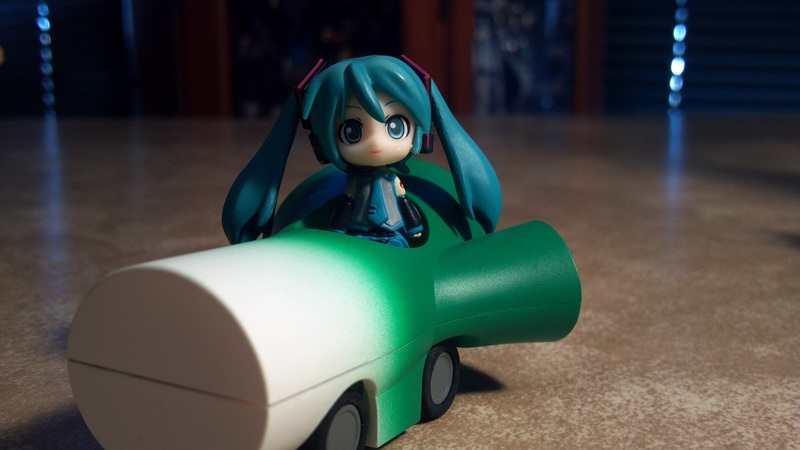 The next one is my very first race queen Miku, the expression on her face is truly magnificent. So bittersweet I absolutely love her face. Her hair is definitely lacking however. 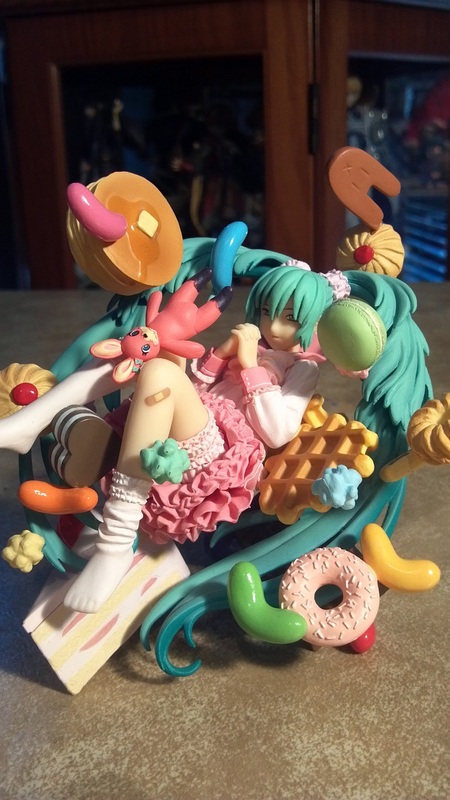 I really wanted this figure for quite sometime. 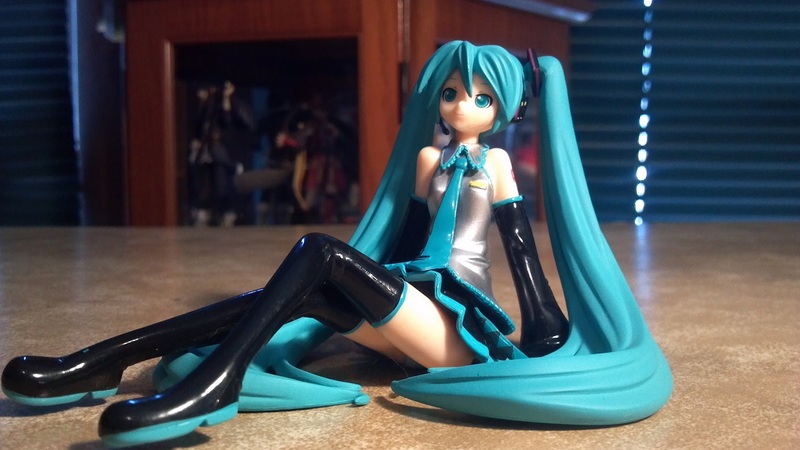 It’s a beautiful figure, and easily the sexiest Miku figure out there. 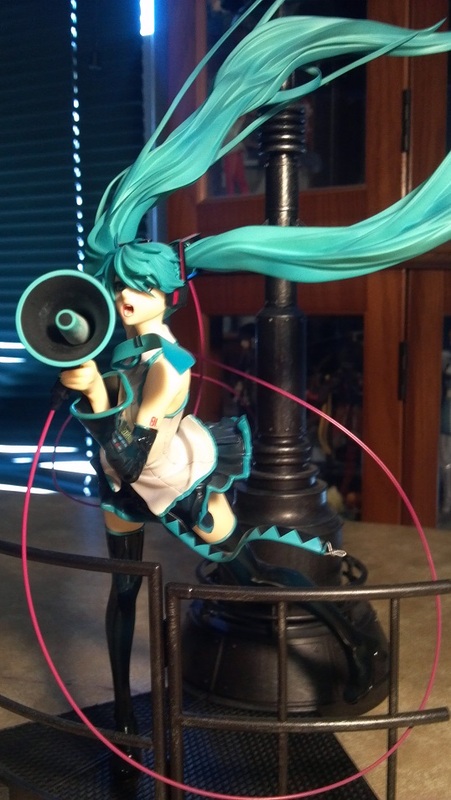 Just recently GSC rereleased her much to my joy. 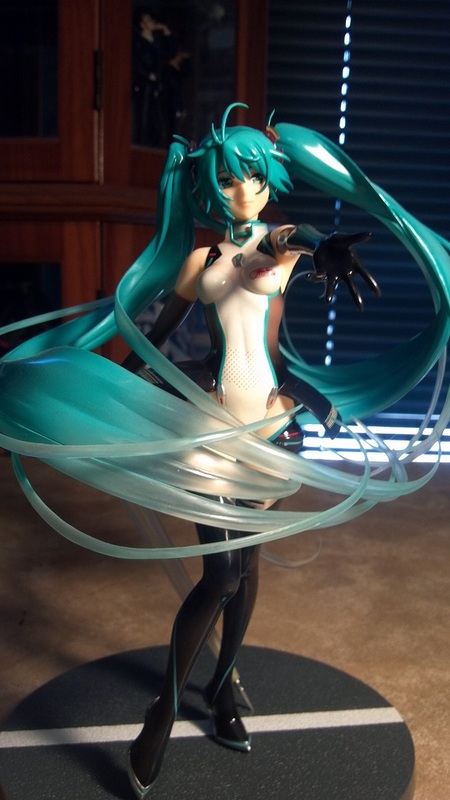 I’m so happy to have gotten my hands on her finally. Then there’s the prize figures. There may only be three of them in my collection so far, but I expect that to grow with time. 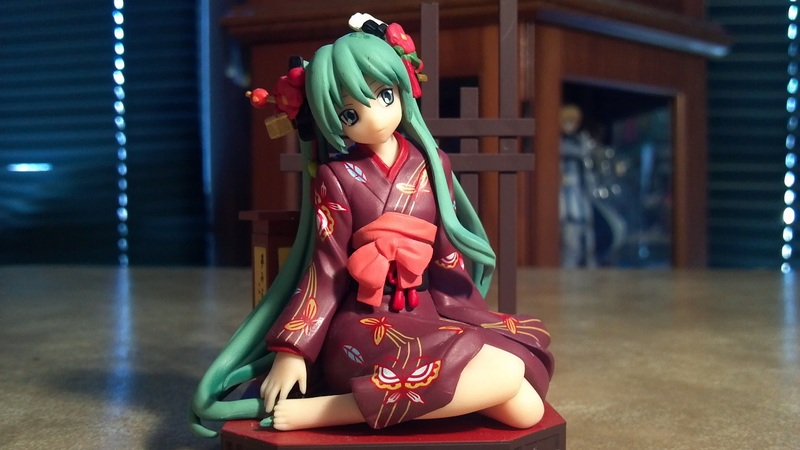 There are always Kuji’s and Sega keeps making nice prize figures of her as well. I found Fairy of Music at a local anime convention last year. She was so super cute that there was no way I could resist buying her. 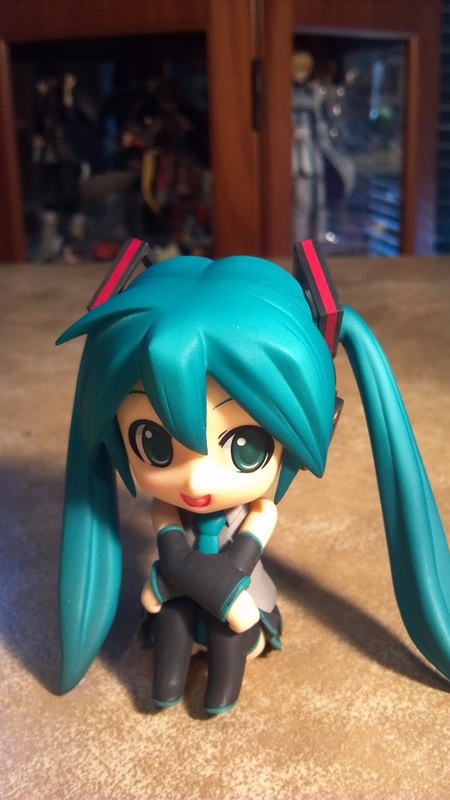 I got this tiny little thing when I participated in my very first Happy Kuji. I wasn’t very fond of it at first, but she’s grown on me a lot since then. 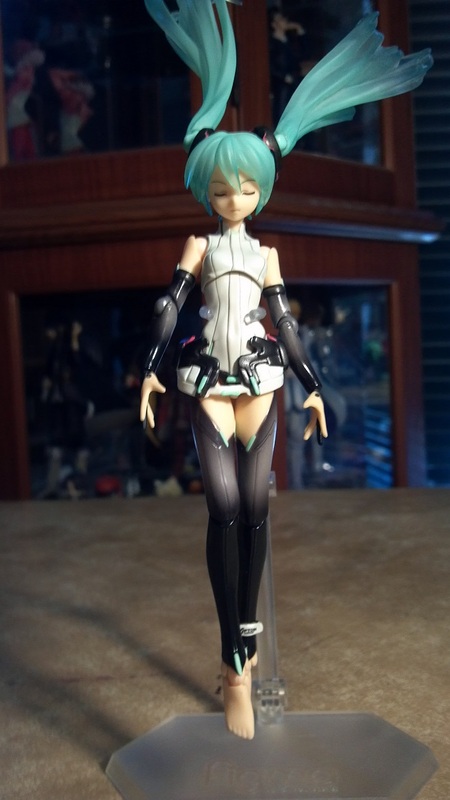 There’s a small collection of figures known as the Mikumos. 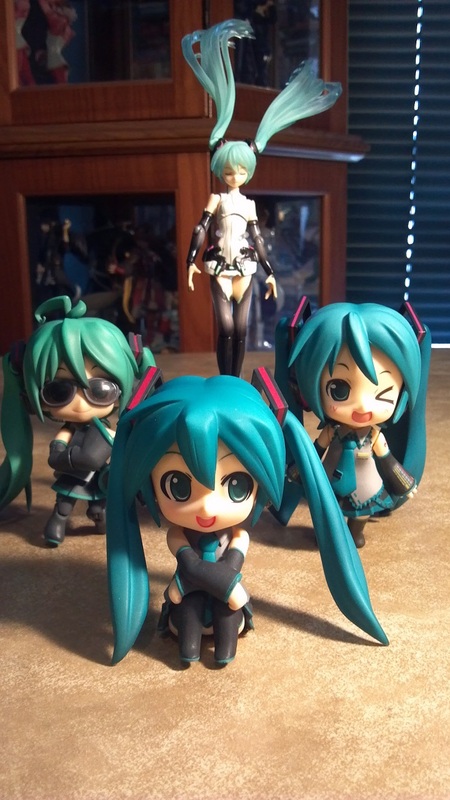 They are all based off of different Miku songs. They are absolutely precious and I love all six of them. 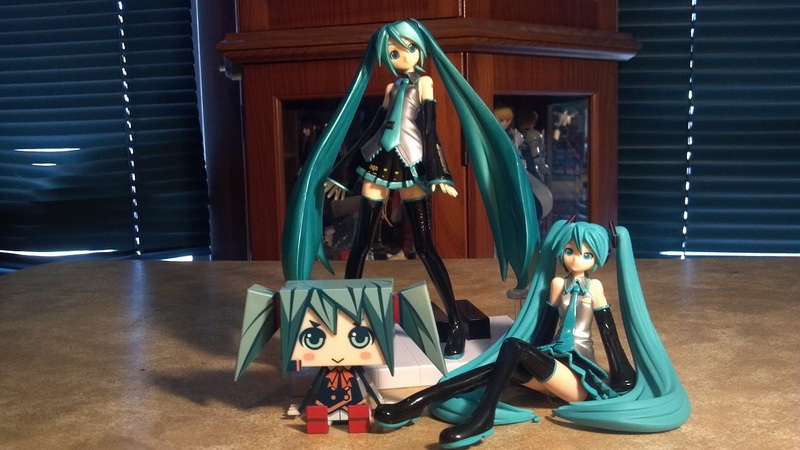 So after the Mikumos I guess the next base to tag is action figures. I haven’t bought too many of them, only four so far, but there will of course be more to come. 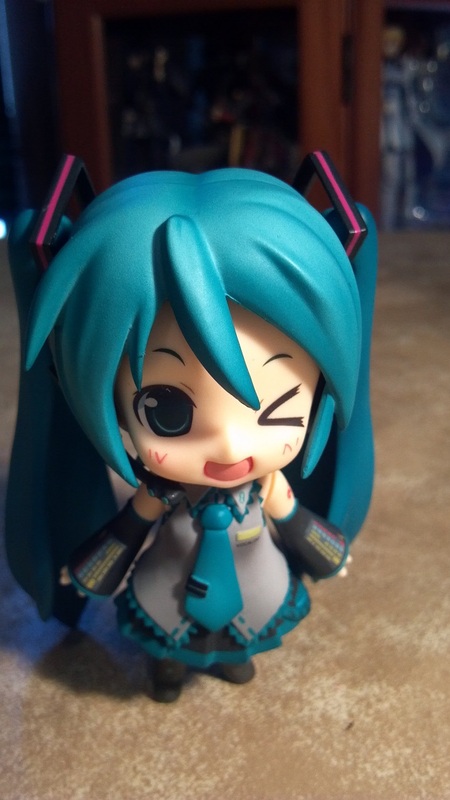 I bought the original Miku nendoroid because she’s just so freaking cute! 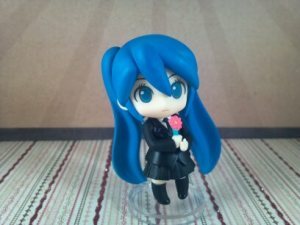 How could I resist picking her up when the original nendos were rereleased? Of course I picked up a full set but that’s far beside the point. 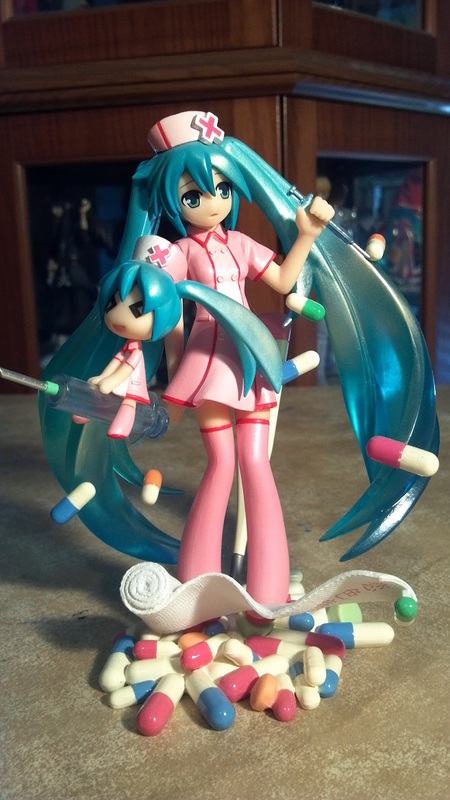 HMO Miku is an adorable figure but honestly it’s kind of piece of crap, but at least it is cute. She just falls apart way too easily. 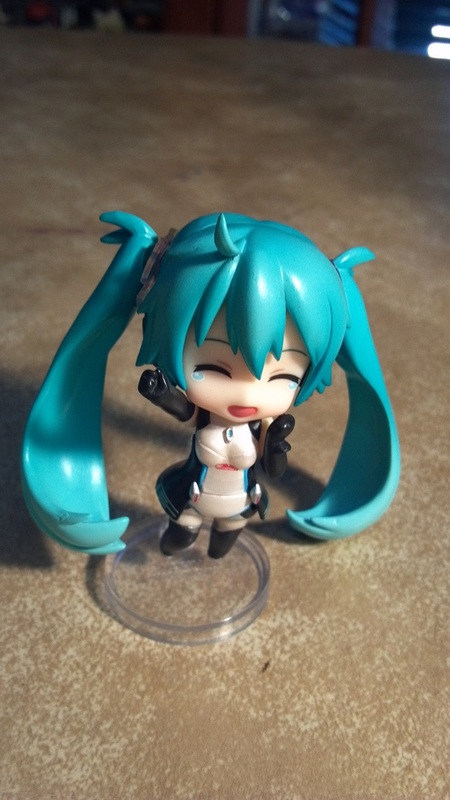 My last Miku nendoroid is probably my least favorite. 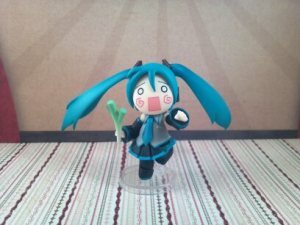 It’s Shuukan Miku. I thought it was kind of funny at first but overexposure has made me kind of dislike it. So I just decided to keep the sitting body and give her a real face. It’s way cuter this way. 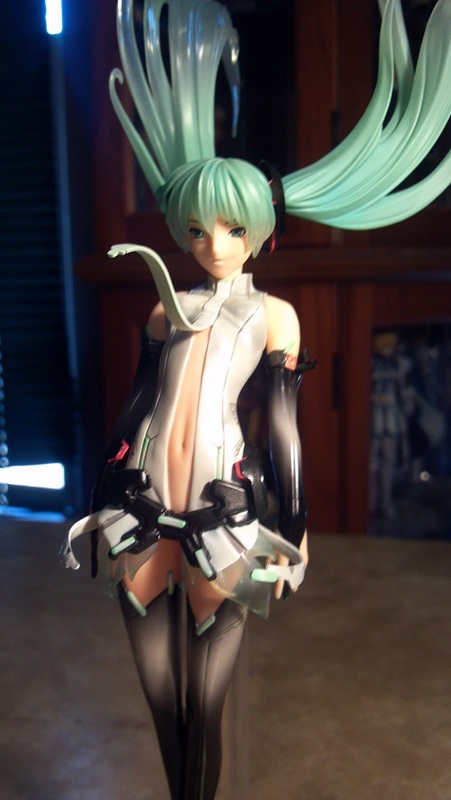 The last action figure currently in my possession is the Append Figma and god help us she’s actually better than the statue in many regards. 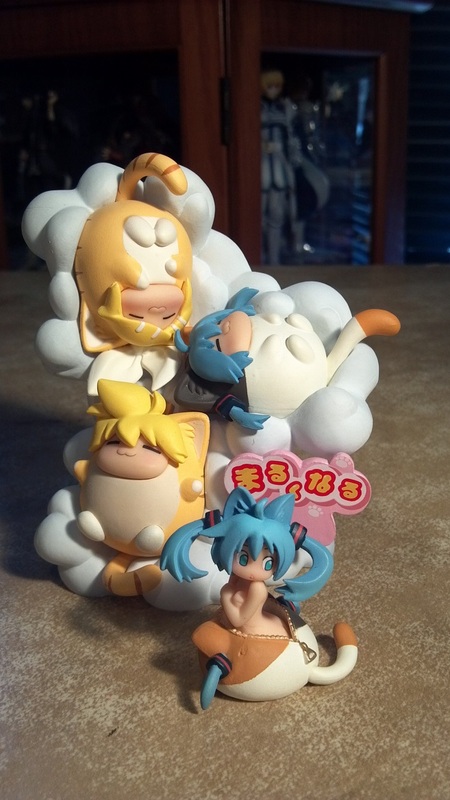 Then there are the Miku petits. They are positively adorable. I don’t have all of them out on display right now though so you’ll have to settle for old pics of a couple of them. 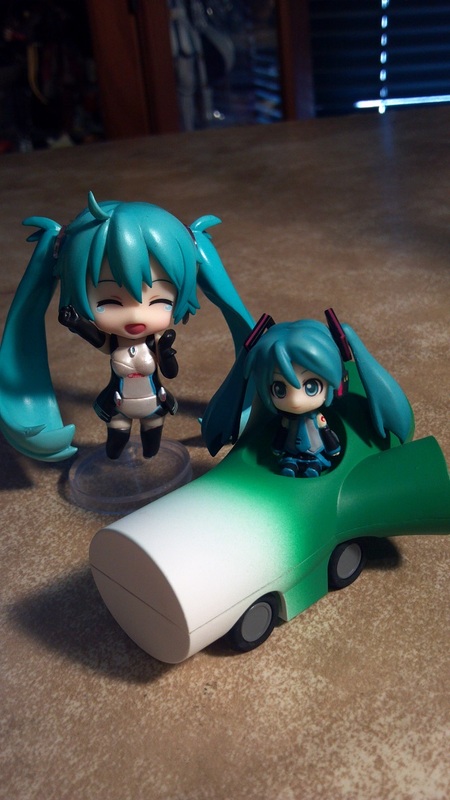 The race miku came in a set of three, she’s precious. I adore her cute little crying face. The pull back car was hell for me to find, it took sometime but she was well worth it. Way too cute to pass up without a fight. 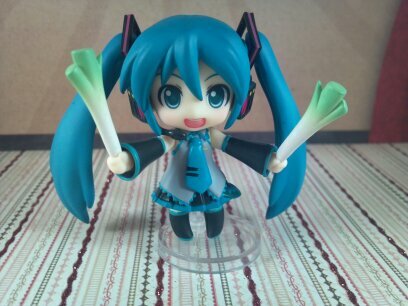 This adorable little petit of Miku is holding her trademark leeks. She’s cute though a little standard. 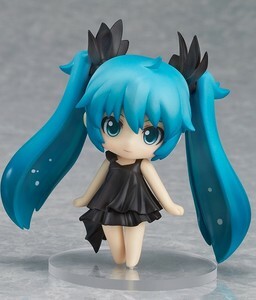 The next Miku petit is wearing a little black dress and holding flowers. She’s cute but kind of looks like she’s in mourning. 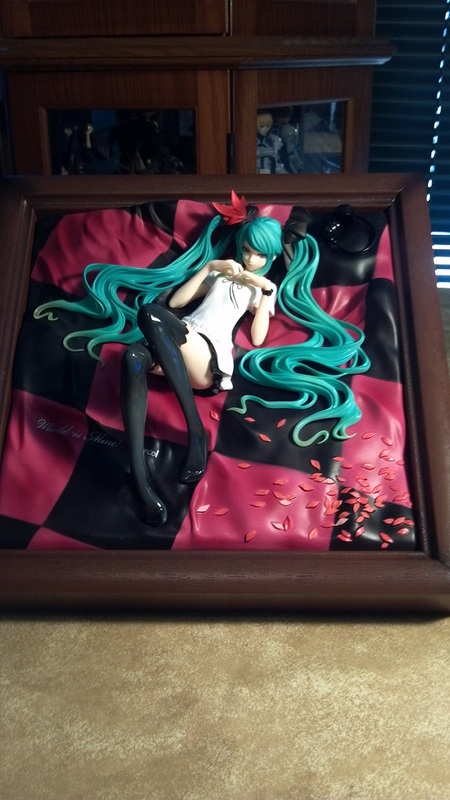 The last of my Mikus is the petit action figure of Hachune Miku. 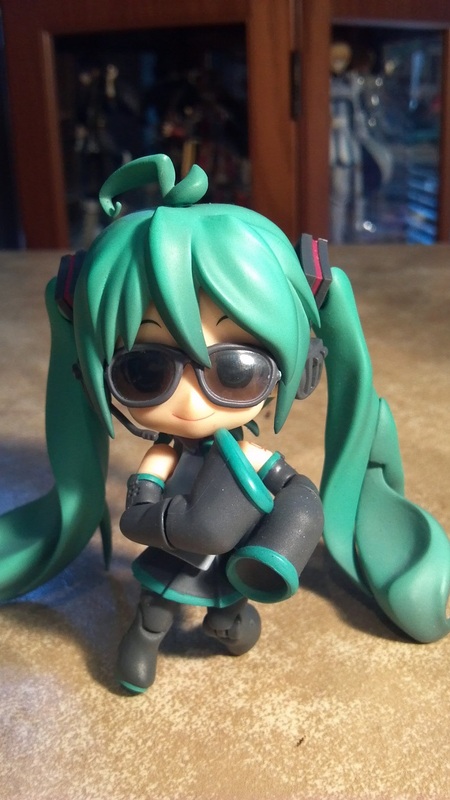 She’s fun and honestly better than the Nendoroids themselves. 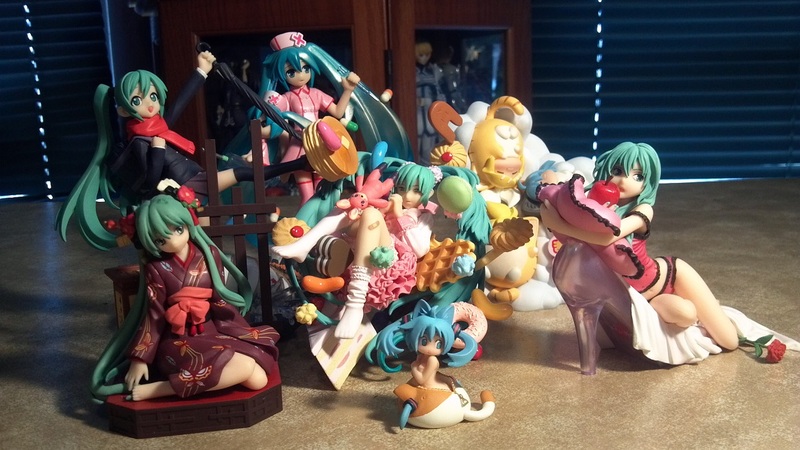 Then there’s the pile of new figures on order. The sexiest is by far the newest Race Queen. She looks gorgeous! 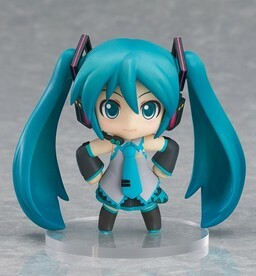 Then there’s the 200th nendo. 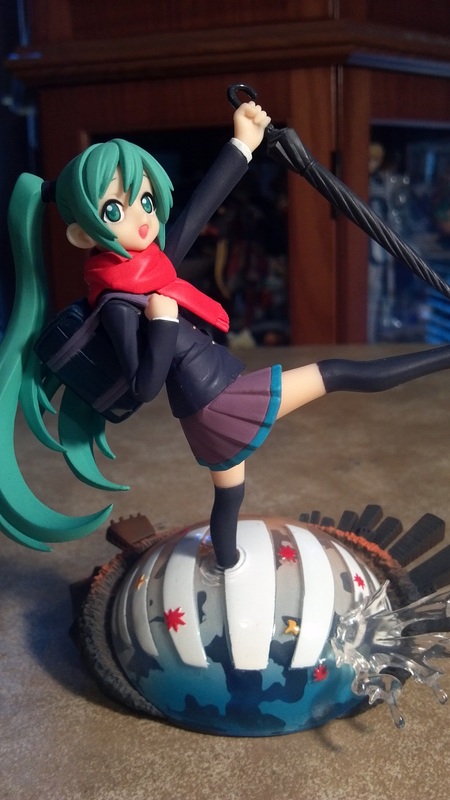 She’s got some awesome accessories and some really cute options, including a petanko pose. 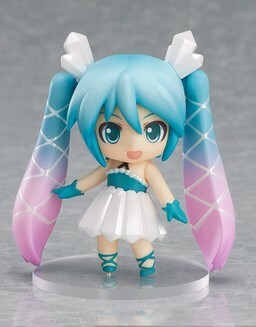 This little Miku looks a little bit fat to me, I mean even for a nendo…….it’s cute though! The next one is a song that we’ve already seen today. 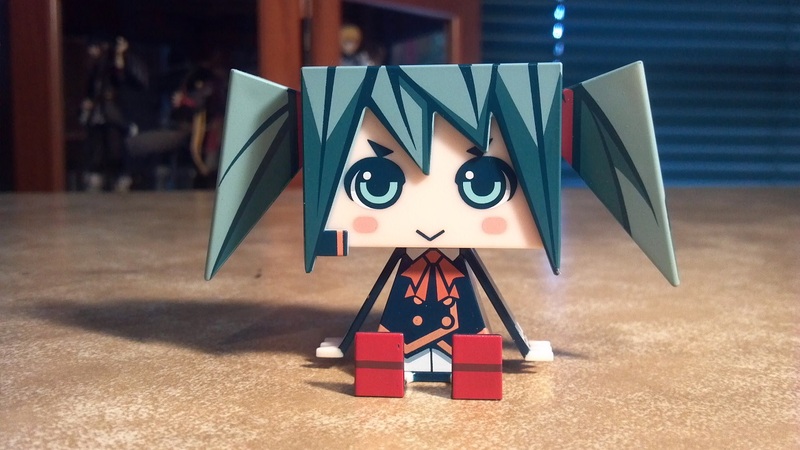 It’s a petit of Romeo and Cinderella Miku. 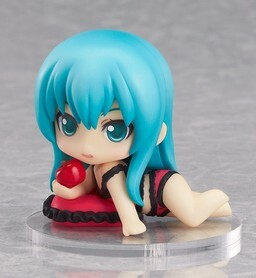 I want this toy so much! I love the Shinkai Shoujo versions hair, it’s precious. I hope the statue turns out this nice looking. The last one is the Micrystal version. I’m not too fond of this one but maybe it’ll grow on me. 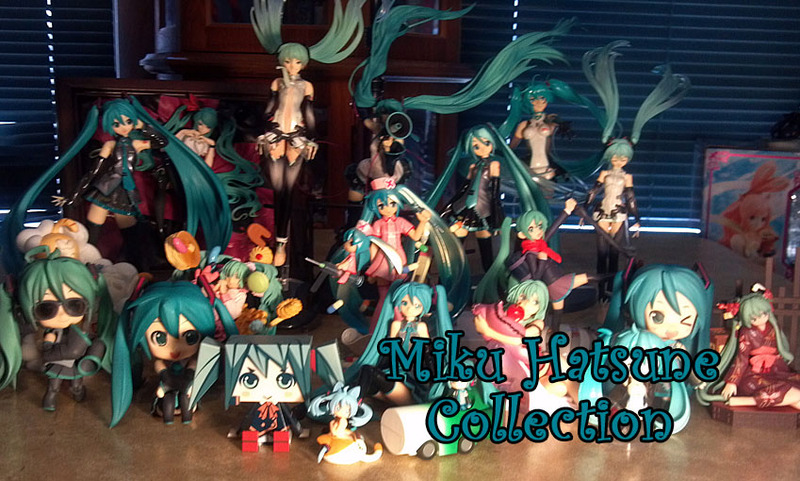 Well that’s that my Hatsune Miku collection and the way it will continue to grow. Hope you enjoyed the looksie! 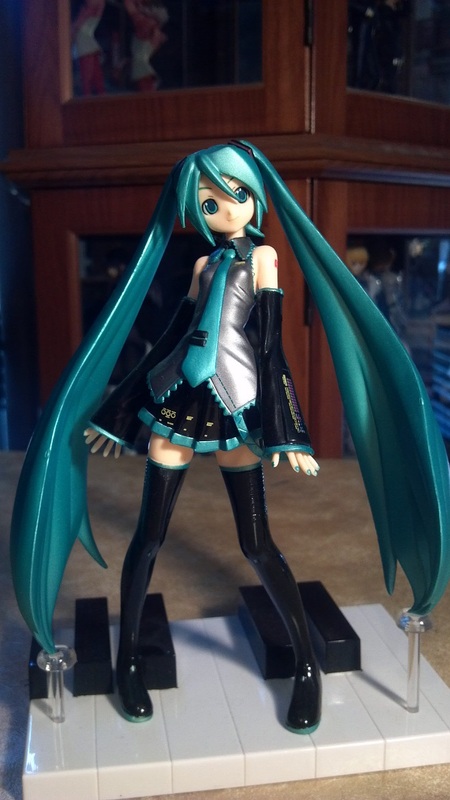 This entry was posted in Anime Figures, Complete Figures and tagged Hatsune Miku, Vocaloid. Bookmark the permalink.